For a Veteran with a spinal cord injury, even the smallest pressure injuries can mean bed rest for weeks. 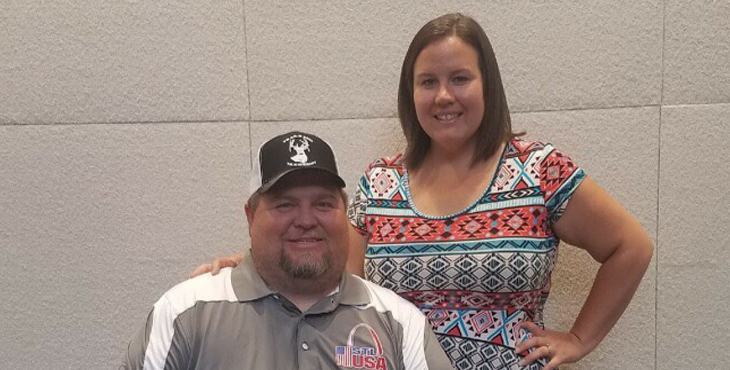 And if you’re as busy as Air Force Veteran Roger Denly, who lives hours from the nearest VA medical center and travels frequently, you’ve got to have options for your care. Denly was on his way back from a long trip when he experienced a potentially concerning injury. “He called our clinic to report a new pressure spot, explaining that on his way home his cushion had leaked air,” said Colleen Berding, then the spinal cord injury telehealth nurse coordinator at the St. Louis VA Medical Center.Knowing that he’d already been on the road for days, Denly’s nurse, wound specialist Charlotte Coleman, asked Berding to lead a real-time VA Video Connect appointment to examine the pressure injury. After Denly became paralyzed in 2014, he and his wife, Rachael, have learned to pay close attention to his skin, watching for spots that can appear in areas experiencing prolonged pressure. “Veterans were always asking, ‘Can I use something on my smartphone?’ and it pained me to keep saying no,” Berding said. “To finally have VA Video Connect to offer, to help someone reduce the chances of a debilitating pressure injury, is really a game changer. As of August 2018, 13 months after VA Video Connect’s launch, there have been more than 130,000 successful Video Connect encounters, and nearly 9,000 VA providers across the country are set up to use the system. This prompt care is a nice strategy to help those that are sick.